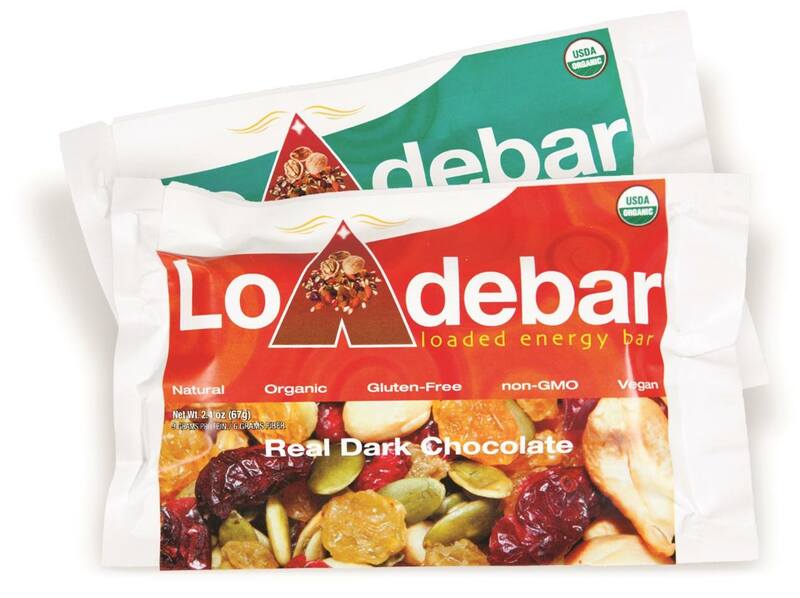 LoAdebar (pronounced “Load Bar”) is one of the best tasting certified organic energy bars on the market. Never heard of it? You will. Loaded with all natural organic ingredients including dates, almonds, walnuts, oats, cashews, chia seeds, sunflower seeds, cranberries, pumpkin seeds, raisins, flax seeds, sesame seeds, cinnamon, brown rice syrup, puffs, and protein, the LoAdebar is one super delicious energy bar. Minimally processed, the LoAdebar is a loaded energy bar with no artificial flavors, colors, preservatives, sweeteners, additives, or synthetic ingredients. Just wholesome ingredients to satisfy your tastes and energize your body. The LoAdebar is also dairy-free, vegan, soy-free, and gluten-free. Each 2.4 ounce bar contains 249 calories, 8 grams of protein, 5 grams of fiber, 14 grams of sugar, and 13 grams of fat (primarily from the nuts and seeds). Low in sodium (17 mg), the LoAdebar has everything you want in a bar and nothing you don’t want which means the only decision is whether to have the Original LoAdebar or the Chocolate LoAdebar. The Chocolate LoAdebar has organic bittersweet certified fair-trade dark chocolate on one side of the bar making it truly scrumptious; otherwise the bar is the same as the original. The Chocolate LoAdebar has 298 calories, 9 grams of protein, 6 grams of fiber, 18 grams of sugar and 17 grams of fat. Made in Ooltewah, Tennessee (about 20 miles east of Chattanooga), the LoAdebar is sold in a unique clear package design that illustrates the ingredients and attributes of the bar on the front and allows you to see the actual ingredients on the other side. Outstanding ingredients, delicious taste, and beautiful packaging all in one amazing LoAdebar. To purchase the bars, go to the company website: www.loadebar.com. A 2-bar full-sized set (one of each variety) can be purchased for $9, postage paid or order a dozen for $41.88 plus postage ($7.95 plus $2.00 for each additional box). The bars are also sold in retail stores (primarily in Tennessee, Chicago, and New York), a list of which can be found on the company locator map: www.loadebar.com.